This scene from the first part Tara Arts epic production ‘Journey to the West’ depicts Saikat Ahamed as Art, leader of the magical white dominion of Caxton Gibbett. The production toured England in Spring 2002. 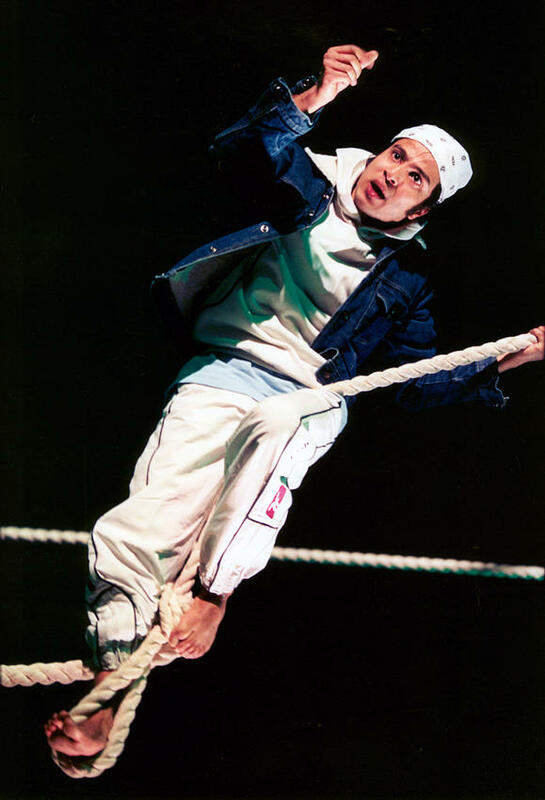 Series notes In 2002 Tara Arts presented Journey to the West, an epic production covering the stories of three generations of South Asians who migrated to Africa and then to the UK. The play is also known as the Trilogy. Part I, 1901: Dhows, Deserts and Dirty Tricks covers the journey of Fateh, Allaudin and Mehta as they leave India to build railroads in East Africa as indentured labourers. Part II, 1968: Rifts, Refugees and Rivers of Blood traces the lives of their descendants, Ranjit, Sita and Liaquat in 1968 in London who left Kenya in the exodus. In Part III, 2001: Bhangra, Bollywood and British Bulldogs the character Kamaal comes to terms with his life on a journey on the M1. Part one and two were done as individual plays in 1988 - 1989 and were reworked for the showcase in 2002 as Journey to the West. The production was based on interviews conducted with members of the South Asian community by Tara Arts about their immigrant experiences, and were carried out in various languages including Urdu, Punjabi and Hindi. The cast of Journey to the West include: Dina Mousawi, Mamta Kash, Najma Akhtar, Ashvin. K. Joshi, Murali Menon, Ravin L. Ganatra and Saikat Ahamed. The production team include Director, Jatinder Verma, Designer, Claudia Mayer, Lighting Design, Ben Ormerod and Sound Design, Scott George and Fergus O_Hara. The production toured in the Spring of 2002 to the following venues: 13 - 16 March 2002, Manchester Contact Theatre, 20 - 23 March 2002, Leicester Haymarket, 24 - 27 April 2002, Birmingham Repertory Theatre, 1- 4 May 2002, Leeds West Yorkshire Playhouse, 8 - 11 May 2002, Darlington Civic Theatre, 15 - 18 May 2002 Cardiff Sherman Theatre, 22 - 25 May 2002 Westcliff - On - Sea Palace Theatre and 29 May - 1 June 2002, Reading Hexagon Theatre.